You can assign a password and other security options so that only those who know the password can open the workbook, or to protect the integrity of your workbook as it moves from person to person. At times, you will want the information to be used but not changed; at other times, you will want only specific people to be able to view the workbook. Setting a workbook as read-only is useful when you want a workbook, such as a company-wide bulletin, to be distributed and read, but not changed. 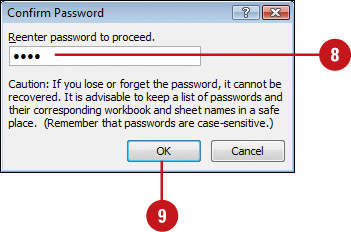 Password protection takes effect the next time you open the workbook. 1. Open the workbook you want to protect. 2. Click the File tab, and then click Save As. 3. Click Tools, and then click General Options. 4. 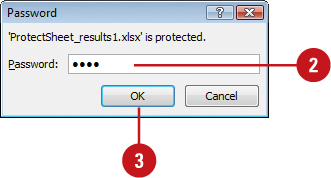 Type a password in the Password to open box or the Password to modify box. It’s critical that you remember your password. If you forget your password, Microsoft can’t retrieve it. 5. Select or clear the Remove automatically created personal information from this file on save check box. 6. 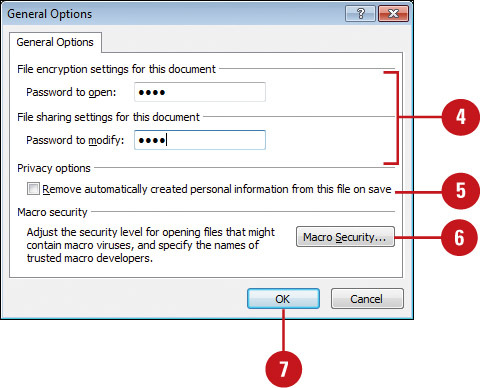 To set macro security options in the Trust center, click Macro Security. 8. Type your password again. 10. If you entered passwords for Open and Modify, type your password again, and then click OK.
11. Click Save, and then click Yes to replace existing workbook. Hackers identify passwords as strong or weak. A strong password is a combination of uppercase and lowercase letters, numbers, and symbols, such as Grea8t!, while a weak one doesn’t use different character types, such as Hannah1. Be sure to write down your passwords and place them in a secure location. 1. Click the File tab, click Open, navigate to a workbook with password protection, and then click Open. 2. 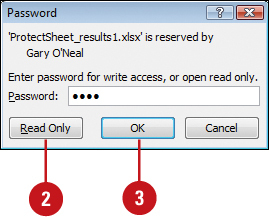 Click Read Only if you do not wish to modify the workbook, or type the password in the Password dialog box. 2. Type the password in the Password dialog box. 4. Click the File tab, click Save As, click Tools, and then click General Options. Change password. Type a new password, click OK, and then retype your password. 7. Click Save, and then click Yes to replace existing workbook.